balance: 1. a state in which opposing forces harmonize; equilibrium. 2. mental equilibrium; mental health; calmness, a state of remaining clear-headed and unperturbed. 3. awareness of both viewpoints or matters; neutrality; rationality; objectivity. Some of the most complex pieces of artwork have balance – arranging elements so that no one part of a work overpowers, or seems heavier than any other part. I live in Newtown, CT. My three young daughters attend school in another district, in another state. When I talked to them about what happened in Newtown and why it happened, one word came to mind. It wasn’t evil. 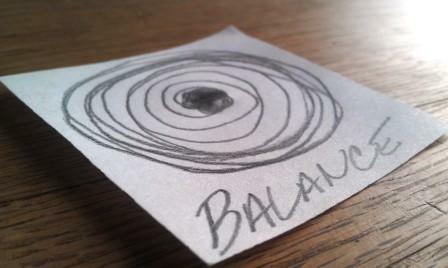 It was balance – the importance of living our lives with balance. Balancing family, relationships, our jobs, careers, school, education, our physical and mental health, politics, religion and our environment….oh and some play time. All of us, whether we’re a parent or not, live in Newtown or not, were greatly affected by what happened December 14, 2012. Yes, the community of Newtown has risen and rallied in model form. They are labeled and seen as “strong.” But Newtown is no different from your community. If your community experienced a similar tragedy, you too would develop a volunteer task force, attend vigils and have the police forces of surrounding towns cover the Christmas shift for the emotionally and physically drained police officers forced to see this life-changing event up-close-and-personal. Your town is Newtown and Newtown is everyone’s town. Was the individual responsible for this abominable tragedy living a balanced life? Are you living a balanced life? I struggle every day. Most of us do. How can we learn from this tragedy? Get a small piece of paper and a pencil. At the bottom of that piece of paper, write “balance.” Then emotionally put yourself in the shoes and in the house of a surviving parent, brother, sister, friend, classmate or neighbor of a fallen Newtown soul. Draw how that makes you feel. Aesthetics do not matter. It can be a simple star, a cross, torn and ripped from the pressure of your pencil…doesn’t matter. Put that piece of paper where you can see it every day. Put it on your dashboard, your bathroom mirror, your desk or next to your bed. It’s a strong trigger and a poignant reminder of the importance of balance. Lastly, whether you’re a chef, auto mechanic, artist or surgeon. It’s all about having the right tool. It can mean the difference between success and failure. If you ask a US Marine what a gun is, he/she may look confused because he/she doesn’t use a gun as a tool; they use a “weapon.” If a Marine uses the term “gun,” they may find themselves doing 50 pushups with three Sergeants on their back. An assault rifle is a weapon…not a gun. A gun is what is used to hunt for food….sport. Is there sport in an assault weapon? By design, none. Nor should it be. It’s a specific tool, designed for a specific task, for a specific user. As a young adult, eager to get my driver’s license, I can still remember that sobering moment when my father stated while I buckled my seat belt, ready for my first lesson. “You’re in control of a two-ton weapon.” he said. I suddenly lost my smile and quickly took my hands off the wheel. I was required to take guided lessons, practice, classes, register and pass tests. Although I passed, it was not a guarantee that I would not be injured or cause injury. But I felt better, my father felt better and the car in front of me and behind probably felt better….safer. Balance is the answer. But we need patience. It’s a process. We can’t transform ourselves overnight. That would be like trying to run a marathon without training. As humans, we resist change. Change takes work. A lot of work. It requires self-awareness, acknowledgement, desire and most importantly, patience. That’s why we often get discouraged, quit and give up. We regress back to our years of conditioned lives….years. We’re trying to change years of long-lived repetitive behavior. Adding to the struggle and challenge, we’re a society where immediate gratification just isn’t quick enough. Ok, so there are two answers…patience and balance. Previous PostSpiritual Liberation – make Art, view Art, buy ArtNext PostMy Broadway, My Super Bowl…the Refrigerator. A beautifully reflective piece Paul.